Doing exercise to lower blood pressure is an excellent idea. It works, and many times it's safer than using drugs. It's way cheaper, too. High blood pressure, medically called hypertension, is a big risk factor for stroke, heart failure, and a host of other ailments. Should You Exercise To Lower Blood Pressure? The short answer is YES! There have been a huge number of studies showing that regular exercise lowers blood pressure. In one review of multiple studies, 54 all agreed that exercise works to lower blood pressure! That's a beautiful agreement of high quality information. Many times after just 3 different periods of physical activity (ex: 3 days of walking, jogging, etc., 30 min per day) your blood pressure will be lower for days, sometimes upto weeks. It will take 1 - 2 weeks of inactivity for your blood pressure to get high again. Doing exercise to lower blood pressure is an excellent idea. It works, and many times it's safer than using drugs. Click here to learn how an advanced degree in healthcare will teach you to develop exercise routines and preventative measures towards lowering high blood pressure. Happily, these benefits are greatest for people with higher blood pressure. So the worse off you are, the more benefit you'll get from starting to exercise again. Physiologically, Why Does Exercise Lower Blood Pressure? When you exercise to lower blood pressure your body becomes more efficient in many ways. For one, your heart becomes stronger and your resting heart rate drops, giving you a more efficient circulatory system. Also, exercise causes your arteries and other blood vessels to open up more. And as your blood vessels open up to get more nutrients to your muscles, your blood pressure drops. What's The Best Exercise to Lower Blood Pressure? As for high blood pressure and exercise, any kind of exercise is better than none. Aerobic exercise (ex: running, walking, biking, dance, etc.) or resistance exercise (ex: weight training, kettlebells, etc.) both help out tons, and are way better than lazing around on the couch. However, aerobic training seems to be more effect at lowering blood pressure than resistance training. Aerobic exercise, literally exercise with oxygen, forces you to breath hard and really improves your heart's functions - helping lower your blood pressure more than lifting weights. First off, doing anything is better than nothing. But if you're lazy, I've got some good news: you don't need to go to the gym every day to lower your blood pressure. Even low amounts of regular exercise have great effects on your body. A basic recommendation is to do 15 - 60 minutes of exercise 3 times a week. That's it. It's simple, pretty darn easy, and will really lower your blood pressure. Even just walking or jogging for that amount of time is good. You don't need to be sprinting or exhausting yourself to death to get healthier. Now you need to start exercising. If you need to, consult with your doctor to make sure exercise to lower blood pressure is the right decision for you. Start slow. If you haven't been exercising, just try walking or jogging for 20 - 30 minutes, 2 - 3 times a week. If you're really interested in getting fit, after you've been jogging a 3 times a week for a few weeks add something new, like weight training. Find what works for you and do it! • Click here to leave 'Exercise to Lower Blood Pressure' & go back to the Complete Strength Training Home-page! 1. Kowalski, Robert E. 2007. 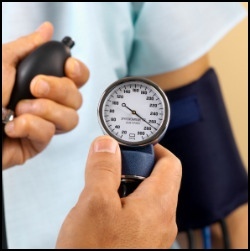 The Blood Pressure Cure: 8 Weeks to Lower Blood Pressure Without Prescription Drugs. Hoboken, N.J.: John Wiley & Sons. Pp. 84. 5. Rubin, Alan L. 2007. High Blood Pressure for Dummies. --For Dummies. Indianapolis, IN: WIley Pub., Inc. Pp. 69-70. 6. Heyward, Vivian H. 1998. Advanced Fitness Assessment & Exercise Prescription. Champaign, IL: Human Kinetics. Pp. 11. 8. Rubin, Alan L. 2007. High Blood Pressure for Dummies. --For Dummies. Indianapolis, IN: WIley Pub., Inc. Pp. 77. 9. Sherwood, Lauralee. 2009. Human Physiology: From Cells to Systems. Australia: Thomson/Brooks/Cole. Pp. 383.